Home Homepage Welcome to DHAStreetsboro.com! 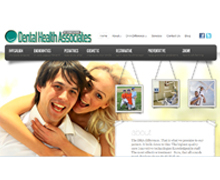 We are proud to announce the new online home of Dental Health Associates of Streetsboro! Here you will find information such as Hours and Location, along with descriptions of the various services we provide and what sets us apart from other dental offices. We believe that this updated website gives our patients and prospective patients a glimpse into our office, which features the newest technology for all your dental needs. We also think that you will quickly see that the DHA Difference makes us the perfect place to help you smile more. Dr. Kremser (who his wife likes to describe as “The King of Useless Knowledge”) is excited to provide frequent blog updates with topics ranging from the latest in dental technology and the latest deals on services, like Invisalign and Zoom! Teeth Whitening, all the way to his reviews of the latest blockbuster movies and whether he thinks the Browns will be ready to compete for the AFC crown in the upcoming season. He may even throw in some of his insights and picks for the fantasy football season! In the meantime, if you have any questions, please visit our Contact Us page and send Dr. Kremser a question. Thanks for checking out the new website! We hope you enjoy!